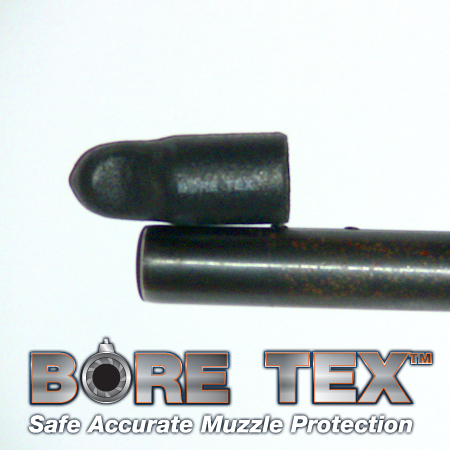 BORE TEX is a small cap used to cover the bore of the barrel of a gun. This revolutionary new product solves problems encountered by hunters and sport shooters when transporting or taking their firearm into the field. It protects the crown of the barrel from damage and covers the open end of the gun barrel preventing debris from entering. Most importantly, this patent pending design enables the gun to be fired with the BORE TEX cap in place… without sacrificing accuracy. These American made BORE TEX caps are created of a specialized, flexible PVC. They have a smooth inner surface and matte textured outer surface with an integrated grab tab. They are flexible, extremely durable, weather resistant, and can be safely fired through if necessary. The smooth inner surface creates a seal when applied and has an internal coating that protects the end of your barrel from corrosion. A matte, textured, outer surface and grab tab makes BORE TEX easy to apply and remove. Flexibility allows the same size cap to fit many different guns of the same caliber, regardless of manufacturer. They are available in 3 sizes, small, medium, and large that fit virtually every barrel. Extremely durable and unaffected by temperatures, light, moisture, dirt; they absolutely will not rip or tear from normal contact with hard surfaces. BORE TEX caps can be safely fired through if time doesn’t permit removal or you forget they are applied. Safety First! Always treat firearms as if they are loaded! You can trust your shot will still be accurate. “Made in the USA” is extremely important to the BORE TEX family. All caps and packaging are proudly made in the United States of America. end of the barrel from corrosion.